Changes to the command and control of ISAF forces in southern Afghanistan that sees the current Regional Command (South) split in two come into force today, Tuesday 1 June 2010. The changes, which were announced on 21 May, are based on the military advice of ISAF commanders on the ground and reflect a number of significant changes over recent months, including the large increase in the number of ISAF troops in southern Afghanistan. See Related News to read more. The changes see a new Regional Command (South West), based in Helmand, which will oversee Helmand and Nimruz provinces, while the existing Regional Command (South), headquartered in Kandahar, will continue to control ISAF forces in Kandahar, Daykundi, Uruzgan and Zabul provinces. Regional Command (South West) will operate under a rotational command, agreed in principle to be shared between US and UK forces. The first commander will be Major General Richard Mills of the US Marine Corps who therefore takes over command today of Task Force Helmand. As part of this reorganisation a flag ceremony was held in Afghanistan today to mark the integration of the US and British aviation forces within Helmand province. Major General Mills, Commander of the US 1st Marine Division, and Group Captain Nick Laird, Commander of the Joint Aviation Group, attended the ceremony designed to mark the start of the new tactical organisation. The three coalition flags of the United States, United Kingdom and Afghanistan were raised to their respective national anthems following prayers for the future of the forces from both American and British aviation padres. 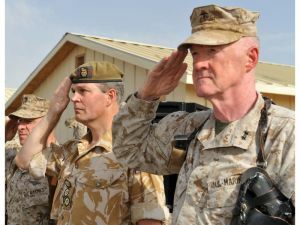 Additionally, under the changes, the command of the 1,100-strong British Battle Group based in Sangin and Kajaki will transfer from Task Force Helmand to the US-led Regimental Combat Team (North), which is taking on responsibility for the north of the province.